Touch quilts can bring comfort, happiness, enjoyment as well as lessen sadness and fear. 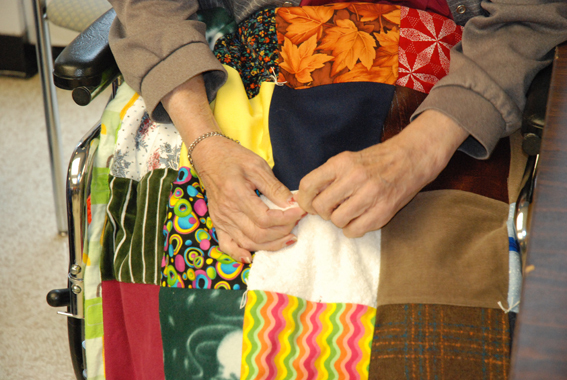 Touch Quilts are crafted by many caring volunteers in the community. The hope is to provide a quilt to every person residing in a personal care home in Manitoba and to create a sense of community giving. The Touch Quilt project is coordinated by Pat Myron and Andrea Frost. If you'd like to contact Pat or Andrea, please email touchquilts@alzheimer.mb.ca or call 204-943-6622 ext 232. Presentations are made throughout the year to personal care homes in Manitoba. Touch Quilts are given to each resident. You can help by sponsoring, assembling or sewing Touch Quilts. The Alzheimer Society of Manitoba exists so that all Manitobans affected by Alzheimer’s disease or another dementia receive the help they need today and have hope for the future. Currently, more than 22,000 Manitobans have Alzheimer's disease or another dementia. This number is growing at alarming rate and by 2038 it is expected to reach over 40,700. The Alzheimer Society of Manitoba offers information, support and education to help people affected by Alzheimer disease or other dementias. The Helpline offers support, information and education to the general public, caregivers and people diagnosed with dementia. alzheimer.mb.caVisit the Alzheimer Society website today! The Alzheimer Society of Manitoba exists so that all Manitobans affected by Alzheimer's disease or another dementia receive the help they need today and have hope for the future. As a province-wide organization, the Society seeks to achieve its mission through community awareness; individual, family and professional education; support programs; and research funding.